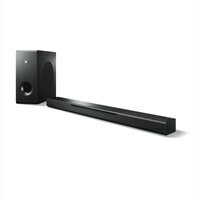 Yamaha MusicCast Sound Bar w/Wireless SubElevate your home cinema experience with exhilarating DTS Virtual:X™ surround sound. Supporting the latest 4K Ultra HD TVs, the MusicCast BAR 400 with wireless subwoofer features Bluetooth® and HDMI®, as well as built-in music streaming services and MusicCast. Elevate your home cinema experience with exhilarating DTS Virtual:X™ surround sound. Supporting the latest 4K Ultra HD TVs, the MusicCast BAR 400 with wireless subwoofer features Bluetooth® and HDMI®, as well as built-in music streaming services and MusicCast.